Now train passengers will be able to book retiring rooms on hourly basis as railways has revised the current practice of 12/24 hours booking rule to cater to the growing demand for lodging facility at railway premises. Now train passengers will be able to book retiring rooms on hourly basis as railways has revised the current practice of 12/24 hours booking rule to cater to the growing demand for lodging facility at railway premises. Railways provides lodging facility through retiring rooms to its passengers at stations spread across the country. The hourly booking service will be operational at a few major stations including Mumbai, Ahmedabad and Surat and later expanded to other stations. Currently, booking of retiring room is being done for the fixed slots of 24 and 12 hours along with fixed tariff for the respective slot. As per the changed rule, retiring room can now be booked for the minimum three hours and maximum up to 48 hours. Passenger can book retiring room for the desired period and it will result in effective use of retiring room, better utilization and also increase in revenue, said a senior Railway Ministry official. However, hourly booking will not be allowed from 9 pm to 9 am as one has to book the entire 12 hours period to avail the room. The tariff would be charged on hourly basis. 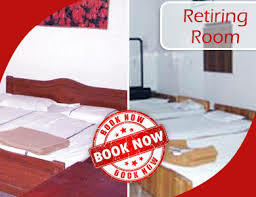 The online booking of retiring rooms can be done through IRCTC website. The facility of booking of retiring room is available only on confirmed and RAC tickets.